Fred Camino circa 2007. Car-free Angeleno since 2005. Regular Source readers may have noticed the Fred Camino byline missing from posts during the last month. The reason: I’m no longer a contributor for The Source because I’m no longer an Angeleno. Life has taken me to the opposite side of the country and I’m now living my car-free life in Brooklyn rather than downtown Los Angeles. While I’m excited that I’ve relocated to one of the most transit-friendly places on Earth, it’s not without a sense of bittersweet fondness for the city that unexpectedly set me on the path to car freedom. Technically, I owned a car for two of the eight years I lived in Los Angeles – but that Honda Accord spent much of those two years parked and collecting soot. My introduction to moving around L.A. without a car really began the moment I moved to the city. I didn’t mix well with L.A.’s traffic and thanks to landing an apartment a short walk from the Hollywood/Western Red Line station, I did mix well with L.A.’s slightly secret transit system. My first boss in L.A. – a man who had lived in the city for 16 years, mind you – had no idea L.A. had a subway when I told him that’s how I was commuting to work. The good news is that eight years later L.A.’s transit system is becoming less of a secret thanks in part to Metro’s marketing and in part to a cultural shift in Angelenos. The fact that almost 68 percent of us voted to tax ourselves for a better transit system in 2008 shows that I wasn’t the only Angeleno looking for an alternative. 1. I moved to downtown L.A. I gave up my car while still living in Hollywood, but quickly realized that if I wanted transit access to the maximum number of places in L.A. then I had to take part in the downtown renaissance. Downtown L.A. is a crazy place – it has amazing shiny bright spots and some of the grimiest dark spots you’ll find in the city – but it’s also one of the few places in L.A. where you can walk on real city blocks and hop on trains and buses that will take you to almost any spot in the county. 2. I made my neighborhood my base. L.A. is a city where people won’t think twice about driving very short or very long distances to get dinner, go grocery shopping or hit up the gym. I chose to live a different life. My L.A. was small – mostly confined to my downtown L.A. neighborhood where I could walk to the things I needed on a daily basis. My grocery store was two blocks away, my gym was two blocks away, my favorite bar was a block away, my favorite restaurant 4 blocks away. The beach? That was for staycations, it’s not in my hood. 3. I rolled with the punches. Look, L.A.’s transit system isn’t perfect. But you know what? No transit system is perfect. And in my opinion, the annoyances of riding transit in L.A. are far fewer than the annoyances of driving a car in L.A. Sure, buses can be late and slow and the trains don’t run 24 hours a day. But when you’re in a car, traffic is just an unpredictable as a bus schedule (and likely the cause of the your late bus) and parking in many parts of the area is pretty much guaranteed to be a (pricey) nightmare. Not to mention, if you’re under 34 a car accident is the most likely way you’ll die. And think about this: most would say that L.A.’s transit system is improving. Very few would say the same of traffic. 4. I got involved. I did it in my own internet-centric way, but my choice to go car-free actually threw me into civic involvement in a way I never imagined for myself. By choosing a lifestyle that was not the established norm, suddenly I had something to advocate for, promote and defend. I started a blog, I attracted like-minded individuals, we had discussions, I attracted the attention of the transit authority, I began blogging for them – and in the end, maybe I’ve impacted just a few people to consider a different sort of lifestyle in Los Angeles. I like to think I’ve had more of an impact on this city than I ever could have imagined when my Honda and I first arrived. Living in L.A. without a car is not impossible, it’s not horrible and it’s the only way I could truly love L.A. Looking back at all my pictures tagged “metro” really makes me realize how essential the public transit lifestyle was for my experience of the city. Memories of Metro adventures with friends, hopping on Metro with my girlfriend to dine at any of L.A.’s fine restaurants, showing visitors around or just taking solo adventures to explore my adopted city are memories I’ll never forget. Go Metro, Go L.A. I’ll miss you, but look forward to returning to see the continued progress. And to those who have read my ramblings over the years, thanks for your support. I’m on all the standard social networks, link up if you’d like to stay in touch. TOMORROW: Fred’s impressions of transit in New York. We’ve missed Fred’s insights and are glad to see him “back” on The Source. He personally met with us and encouraged us to keep posting our Metro adventures on http://metroduo.wordpress.com/ where we report on Metro accessible events and explore LA by Metro …We’re looking forward to Fred’s adventures on that Big Metro to the east. I am car free since 1989! I live in West LA and the Santa Monica Big Blue Bus is my primary mode of transportation. However, I also use the Metro when I want to go to downtown LA, watch matinees at the Pantages, explore Chinatown and Pasadena, etc.. I have also taken Amtrak for trips outside congested LA. Santa Barbara and San Luis Obispo are becoming my favorite weekend destinations. I’ve enjoyed reading your take on transit in L.A. over the past 4 years! Thanks for making the effort to produce your blog and write for the Source. Looking forward to any comparisons you’ll make between our system and the well-established one in NY! Yes we can, as long as the operators and/or mechanics do not go on strike! Ask me about it! I went through all three recent strikes, 1994, 2000, 2003. And who can forget the 35-day strike in 2003? It was so good to have you while you’re here, Fred. Thanks for all the insights and good luck in NYC! Thanks for your contribution and articles to thesource. I hope you find NY a better place to live than I felt. Yes, public transport in NYC is much better than LA. But word of advice: you’ll quickly learn to dislike the constant fare hikes, unannounced service closures, and the rude NYMTA unions. I have been car free for 39 years in Southern California, it all started out with by walking, the bike, then skateboard, then then OLD defunct RTD system, now Metro is the fastest growing public transit system globally if not just North America and it makes getting around very easy. I do have a scooter that I use in getting to hard to reach places, it’s basically $10/week for gasoline (~150 miles/tank) it is much cheaper than a $5 day pass but with our newborn we have been using metro every weekend. He started riding when he was 1 week old (Wilshire/Western to Sunset/Vermont Kasier Hospital) and we are not the only parents with newborns on the metro, so he will not grow up being a car dummy, unless he wants to race cars that is professionally. Pretty much car free 5 out of 7 days a week now, mainly use my scooter to commuter and the only 2 days I need the car is to buy groceries and housing needs in bulk at Costco on the weekends. One thing that is fun about NYC (vs. Los Angeles) are all the ferries. And, if you have the time and the $$$, you can still go across the Atlantic airplane-free! Fred’s metrorider blog was instrumental in helping me become less car dependent and fostering the LA-based transit culture. Before The Source, there was no reliable source (pun intended I guess) of info on LA’s public transportation related news. Sure, there were outlets like Streetblog and a few others but they were more urban living advocates than just strictly a blog about LA transit. Fred’s blog had helpful tips for newbies and thoughtful discussions on how to improve the transit system. All of which, he end up bring over to The Source, which is now the defacto publisher of record for this type of stuff in LA. I too have noticed the disappearance of Fred on The Source; I would always expect his name to pop up on the Go Metro Weekends segment. Just want to wish Fred the best of luck in “the Tri-State area” (media name of NYC) and to get used to reading up on MTA NYC’s “The Weekender” page that is put up detailing rail service advisories that helped me when I was in NYC two months ago. I had always been a fan of Fred’s insight of LA public transit with a lifestyle twist that is unmatched by any other writer out there, from the MetroRiderLA blog to being one of the original writers of this wonderful blog; I will miss reading about his LA experiences, but look forward to reading his New York City experience. I would love to hear about his opinion on The High Line park. I’ve been car free too, since 1998. I came to LA from a small town in GA. The biggest incentive for taking Metro is that my company offers free monthly pass! Score!! I too have now been a carless Angeleno for almost 2 years. Just about two years ago my car was totaled in a freeway accident. It didn’t phase me. IT happens. I still drive when I need to. It did however purge me of a car loan, the need for gas, and the pricey insurance i was paying. I had been a production Assistant at a VFX studio in South Pasadena until about 2 weeks prior to my accident and was required to drive for work. I had been promoted to a position that didn’t require me to drive for work and had already started apt hunting for something in my new price range. The lack of the costs of car ownership opened up many of our more bustling, metro-centric, city hubs to me and I moved into a place in Hollywood. It’s been great. I’m 5 minutes from a red line station and my office is 3 minutes from a gold line station. To top it off, The new Zip Car initiative in Hollywood felt kind enough to place three of them outside my door. Now they are all over LA. Check them out at zipcar.com if you aren’t familiar. They rent cars by the hour. Gas and insurance included. Not to mention just being a member ($50 a year) counts you as an insured driver should you decide to own a car again. Having continuous previous insurance helps get new insurance. Metro life in LA is possible … and I love it! I live in the Valley, where Metro isn’t so great. Still, I am very thankful for what Rapid buses there are, and especially the Orange Line. 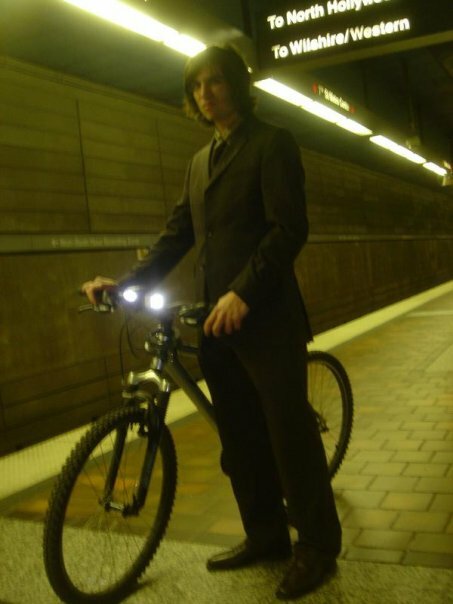 In conjunction with my bicycle, and my not being afraid to run to get the bus – whether it’s down the block (local bus) or at Balboa station (half a mile away) – it’s been a very helpful way to get around town. I’ve been without a car in LA for six or so years. When I was working full time I saved money each month, enough for a car note, insurance and gas. Now that I’m without that job, I’m putting that money to good use. I’m glad I didn’t buy a car, otherwise I’d probably be living it. (That was supposed to be a joke.) Anyway, great post. New York has always been my destination as well, unless I happen to find a decent job and place to live over the hill when I get my degree in May. Thanks for the insight, Fred.